This article is about the psychological assessment. For the statistical test, see p-value. The Psychopathy Checklist or Hare Psychopathy Checklist-Revised, now the Psychopathy Checklist—revised (PCL-R), is a psychological assessment tool most commonly used to assess the presence of psychopathy in individuals. It is a 20-item inventory of perceived personality traits and recorded behaviors, intended to be completed on the basis of a semi-structured interview along with a review of 'collateral information' such as official records. The PCL was originally developed in the 1970s by Canadian psychologist Robert D. Hare for use in psychology experiments, based partly on Hare's work with male offenders and forensic inmates in Vancouver, and partly on an influential clinical profile by American psychiatrist Hervey M. Cleckley first published in 1941. An individual's score may have important consequences for their future, and because the potential for harm if the test is used or administered incorrectly is considerable, Hare argues that the test should be considered valid only if administered by a suitably qualified and experienced clinician under scientifically controlled and licensed, standardized conditions. Hare receives royalties on licensed use of the test. In psychometric terms, the current version of the checklist has two factors (sets of related scores) that correlate about 0.5 with each other, with Factor One closer to Cleckley's original personality concept than Factor Two. Hare's checklist does not incorporate the "positive adjustment features" that Cleckley did. The PCL-R is used for indicating a dimensional score, or a categorical diagnosis, of psychopathy for clinical, legal or research purposes. It is rated by a mental health professional (such as a psychologist or other professional trained in the field of mental health, psychology, or psychiatry), using 20 items. Each of the items in the PCL-R is scored on a three-point scale according to specific criteria through file information and a semi-structured interview. The scores are used to predict risk for criminal re-offense and probability of rehabilitation. The current edition of the PCL-R officially lists three factors (1.a, 1.b, and 2.a), which summarize the 20 assessed areas via factor analysis. The previous edition of the PCL-R listed two factors. Factor 1 is labelled "selfish, callous and remorseless use of others". Factor 2 is labelled as "chronically unstable, antisocial and socially deviant lifestyle". There is a high risk of recidivism and mostly small likelihood of rehabilitation for those who are labelled as having "psychopathy" on the basis of the PCL-R ratings in the manual for the test, although treatment research is ongoing. PCL-R Factors 1a and 1b are correlated with narcissistic personality disorder. They are associated with extraversion and positive affect. Factor 1, the so-called core personality traits of psychopathy, may even be beneficial for the psychopath (in terms of nondeviant social functioning). PCL-R Factors 2a and 2b are particularly strongly correlated to antisocial personality disorder and borderline personality disorder and are associated with reactive anger, criminality, and impulsive violence. The target group for the PCL-R in prisons in some countries is criminals convicted of delict and/or felony. The quality of ratings may depend on how much background information is available and whether the person rated is honest and forthright. Each of the 20 items in the PCL-R is scored on a three-point scale, with a rating of 0 if it does not apply at all, 1 if there is a partial match or mixed information, and 2 if there is a reasonably good match to the offender. This is said to be ideally done through a face-to-face interview together with supporting information on lifetime behavior (e.g. from case files), but is also done based only on file information. It can take up to three hours to collect and review the information. Out of a maximum score of 40, the cut-off for the label of psychopathy is 30 in the United States and 25 in the United Kingdom. A cut-off score of 25 is also sometimes used for research purposes. High PCL-R scores are positively associated with measures of impulsivity and aggression, Machiavellianism, persistent criminal behavior, and negatively associated with measures of empathy and affiliation. Early factor analysis of the PCL-R indicated it consisted of two factors. Factor 1 captures traits dealing with the interpersonal and affective deficits of psychopathy (e.g., shallow affect, superficial charm, manipulativeness, lack of empathy) whereas factor 2 dealt with symptoms relating to antisocial behavior (e.g., criminal versatility, impulsiveness, irresponsibility, poor behavior controls, juvenile delinquency). The two factors have been found by those following this theory to display different correlates. Factor 1 has been correlated with narcissistic personality disorder, low anxiety, low empathy, low stress reaction and low suicide risk but high scores on scales of achievement and social potency. In addition, the use of item response theory analysis of female offender PCL-R scores indicates factor 1 items are more important in measuring and generalizing the construct of psychopathy in women than factor-2 items. In contrast, factor 2 was found to be related to antisocial personality disorder, social deviance, sensation seeking, low socioeconomic status and high risk of suicide. The two factors are nonetheless highly correlated and there are strong indications they do result from a single underlying disorder. Research, however, has failed to replicate the two-factor model in female samples. In 2001 researchers Cooke and Michie at Glasgow Caledonian University suggested, using statistical analysis involving confirmatory factor analysis, that a three-factor structure may provide a better model, with those items from factor 2 strictly relating to antisocial behavior (criminal versatility, juvenile delinquency, revocation of conditional release, early behavioral problems and poor behavioral controls) removed. The remaining items would be divided into three factors: arrogant and deceitful interpersonal style, deficient affective experience and impulsive and irresponsible behavioral style. Hare and colleagues have criticized the Cooke & Michie three-factor model for statistical and conceptual problems, like in fact consisting of up to ten different factors and resulting in impossible parameters (negative variances). In the 2003 edition of the PCL-R, Hare added a fourth antisocial behavior factor, consisting of those factor-2 items excluded in the previous model. Again, these models are presumed to be hierarchical with a single, unified psychopathy disorder underlying the distinct but correlated factors. In the four-factor model of the psychopathy, supported by a range of samples, the factors represent the interpersonal, affective, lifestyle, and overt antisocial features of the personality disorder. The PCL-R is widely used to assess individuals in high security psychiatric units, prisons and other settings. This may be of help in deciding who should be detained or released, or who should undergo what kind of treatment. It is also used for its original purpose - to carry out basic psychology studies of psychopathy. The PCL-R also has some wide use as a risk assessment tool that attempts to predict who will offend or reoffend. It has been touted as unparalleled in its ability in this regard, and there have been some positive studies, especially early on. However, several recent studies and very large-scale meta-analysis have cast serious doubt on whether it performs as well as other instruments, or better than chance, and to the extent that it does, whether this is largely due its inclusion of past offending history, rather than the personality trait scores that make it unique. In addition although in controlled research environments the inter-rater reliability of the PCL-R may be satisfactory, in real-world settings it has been found to have rather poor agreement between different raters, especially on the personality trait scores. Further, a review which pooled together various risk assessment instruments including the PCL, found that peer-reviewed studies on which the developer or translator of the instrument was an author (which in no case was disclosed in the journal article) were twice as likely to report positive predictive findings. 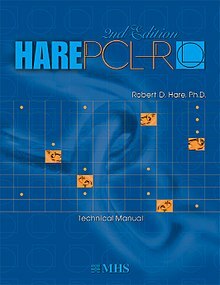 On the purported basis of concerns about false positives, inadequately trained raters, and general misuse or overuse of the test including with different racial groups, an advice guide was published in 2011 on how to pass the Hare PCL-R. There are additional inventories directly from the PCL-R, including the Psychopathy Checklist: Screening Version (PCL:SV) and Psychopathy Checklist: Youth Version (PCL:YV). The PCL:SV was developed as a labor-saving assessment for the same forensic settings as the PCL-R and to meet the needs of settings where clients do not necessarily have criminal records (e.g. civil psychiatric patients). It includes 12 items and takes 90 minutes. According to the MacArthur violence risk assessment study, there is a stronger correlation between the PCL:SV results and later violence than any other of the 134 variables evaluated in that study. The PCL:YV assesses early signs of juvenile psychopathy in children and adolescents. Among laypersons and professionals, there is much confusion about the meanings and differences between psychopathy, sociopathy, antisocial personality disorder (ASPD), and the ICD-10 diagnosis, dissocial personality disorder. Hare takes the stance that psychopathy as a syndrome should be considered distinct from the DSM-IV's antisocial personality disorder construct, although the DSM states ASPD has been referred to as or includes the disorder of psychopathy. However, those who created the DSM-IV felt that there was too much room for subjectivity on the part of clinicians when identifying things like remorse and guilt; therefore, the DSM-IV panel decided to stick to observable behavior, namely socially deviant behaviors. As a result, the diagnosis of ASPD is something that the "majority of criminals easily meet". Hare goes further to say that the percentage of incarcerated criminals that meet the requirements of ASPD is somewhere between 80 and 85 percent, whereas only about 20% of these criminals would qualify for a psychopathy diagnosis using the PCL-R. This twenty percent, according to Hare, accounts for 50 percent of all the most serious crimes committed, including half of all serial and repeat rapists. Although the diagnosis of ASPD covers two to three times as many prisoners than the diagnosis of psychopathy, Hare believes the PCL-R is better able to predict future criminality, violence, and recidivism than a diagnosis of ASPD. He suggests there are differences between PCL-R-diagnosed psychopaths and non-psychopaths on "processing and use of linguistic and emotional information", while such differences are potentially smaller between those diagnosed with ASPD and without. Additionally, Hare argued confusion regarding how to diagnose ASPD, confusion regarding the difference between ASPD and psychopathy, as well as the differing future prognoses regarding recidivism and treatability, may have serious consequences in settings such as court cases where psychopathy is often seen as aggravating the crime. Hare wants the Diagnostic and Statistical Manual of Mental Disorders to list psychopathy as a unique disorder, saying psychopathy has no precise equivalent in either the DSM-IV-TR, where it is most strongly correlated with the diagnosis of antisocial personality disorder, or the ICD-10, which has a similar diagnosis called dissocial personality disorder. Both organizations state their diagnoses have been referred to as or include the disorder of psychopathy. But only a minority of those in institutions whom Hare and his followers would diagnose as psychopaths are violent offenders. There has been some controversy over the use of the PCL-R by UK prison and secure psychiatric services, including its role in the government's new administrative category of 'Dangerous and Severe Personality Disorder' (a separate older administrative category of 'psychopathic disorder' in the Mental Health Act was abolished in 2007). One leading forensic psychologist, while Deputy Chief at the Ministry of Justice, has argued that it has not lived up to claims that it could identify those who would not benefit from current treatments or those most likely to violently reoffend. A study by one of Hare's students, Randy Kropp, on a group of prisoners found that among those who had low scores on the PCL-R, about 20 to 25 percent would be re-convicted within four or five years, while in the "high group", that risk was about 80 percent. A study using the PCL-R to examine the relationship between antisocial behavior and suicide found that suicide history was strongly correlated to PCL-R factor 2 (reflecting antisocial deviance) and was not correlated to PCL-R factor 1 (reflecting affective functioning). Given that ASPD relates to factor 2, whereas psychopathy relates to both factors, this would confirm Hervey M. Cleckley's assertion that psychopaths are relatively immune to suicide. People with ASPD, on the other hand, have a relatively high suicide rate. The PCL-R is sometimes used to assess risk of sexual (re)offending, with mixed results. Since psychopaths frequently cause harm through their actions, it is assumed that they are not emotionally attached to the people they harm; however, according to the PCL-R checklist, psychopaths are also careless in the way they treat themselves. They frequently fail to alter their behavior in a way that would prevent them from enduring future discomfort. Because an individual's scores may have important consequences for his or her future, the potential for harm if the test is used or administered incorrectly is considerable. The test can only be considered valid if administered by a suitably qualified and experienced clinician under controlled conditions. Hare has described psychopaths as 'social predators', 'remorseless predators', or in some cases 'lethal predators', and has stated that 'Psychopathic depredations affect people in all races, cultures, and ethnic groups, and at all levels of income and social status'. In addition to the aforementioned report by Cooke and Michie that a three-factor structure may provide a better model than the two-factor structure, Hare's concept and checklist have faced other criticisms. Hare's concept has also been criticised as being only weakly applicable to real-world settings and tending towards tautology. It is also said to be vulnerable to "labeling effects", to be over-simplistic, reductionistic, to embody the fundamental attribution error, and not pay enough attention to context and the dynamic nature of human behavior. It has been pointed out that half the criteria can also be signs of mania, hypomania, or frontal lobe dysfunction (e.g., glibness/superficial charm, grandiosity, poor behavioral controls, promiscuous sexual behavior, and irresponsibility). Some research suggests that ratings made using the PCL system depend on the personality of the person doing the rating, including how empathic they themselves are. One forensic researcher has suggested that future studies need to examine the class background, race and philosophical beliefs of raters because they may not be aware of enacting biased judgments of people whose section of society or individual lives they have no understanding of or empathy for. Canadian serial killer duo Paul Bernardo and Karla Homolka were assessed using the checklist. Bernardo scored 35/40, and Homolka 5/40. "Wayne", subject of Channel 4's 2000 documentary film Psychopath, achieved the "extremely rare" score of 40/40. ^ Venables NC, Hall JR, Patrick CJ (2013). "Differentiating psychopathy from antisocial personality disorder: a triarchic model perspective". Psychol Med. 44 (5): 1005–13. doi:10.1017/S003329171300161X. PMID 23834781. ^ "Psychopathic traits differ between cultures, experts claim". The Independent. 2018-02-12. Retrieved 2018-02-16. ^ a b c d e Hare, Robert D. (2003). Manual for the Revised Psychopathy Checklist (2nd ed.). Toronto, Ontario, Canada: Multi-Health Systems. ^ a b Hare, R. D., & Neumann, C. N. (2006). The PCL-R Assessment of Psychopathy: Development, Structural Properties, and New Directions. In C. Patrick (Ed. ), Handbook of Psychopathy (pp. 58–88). New York: Guilford. ^ Carey, Benedict (June 11, 2010). "Legal Fight Delays Paper on Psychopathy Scale 3 Years". The New York Times. ^ Fowles, Don C. (December 2011). "Current Scientific Views of Psychopathy". Psychological Science in the Public Interest. 12 (3): 93–94. doi:10.1177/1529100611429679. PMID 26167884. Retrieved 21 May 2013. ^ Hare, Robert D. (1991). The Hare Psychopathy Checklist-Revised. North Tonawanda, New York: Multi-Health Systems. ^ a b Huchzermeier, C.; Geiger, F.; Bruss, E.; Godt, N.; Köhler, D.; Hinrichs, G.; Aldenhoff, JB. (2007). "The relationship between DSM-IV cluster B personality disorders and psychopathy according to Hare's criteria: clarification and resolution of previous contradictions". Behavioral Science and the Law. 25 (6): 901–11. doi:10.1002/bsl.722. PMID 17323344. ^ a b Skeem, Jennifer L.; Poythress, Norman; Edens, John F.; Lilienfeld, Scott O.; Cale, Ellison M. (2002). "Psychopathic personality or personalities? Exploring potential variants of psychopathy and their implications for risk assessment" (PDF). Aggression and Violent Behavior. 8 (5): 513–546. doi:10.1016/S1359-1789(02)00098-8. Archived from the original (PDF) on 24 January 2013. Retrieved 29 August 2013. ^ a b c d e Skeem, J. L.; Polaschek, D. L. L.; Patrick, C. J.; Lilienfeld, S. O. (2011). "Psychopathic Personality: Bridging the Gap Between Scientific Evidence and Public Policy". Psychological Science in the Public Interest. 12 (3): 95–162. doi:10.1177/1529100611426706. ^ Semple, David (2005). The Oxford Handbook of Psychiatry. Oxford University Press. pp. 448–9. ISBN 978-0-19-852783-1. ^ Starr, Michelle (October 28, 2017). "Study Says That Psychopaths With Their Lack of Empathy Can Actually Be Useful For Society". ScienceAlert. Retrieved February 28, 2018. ^ Wood, Janice (May 11, 2012). "Scans Show Psychopaths Have Brain Abnormalities". Psych Central. Retrieved February 28, 2018. ^ a b c d e f g h i Hare, R.D. ; Harpur, T.J.; Hakstian, A.R. (1989). "Two-factor conceptualization of psychopathy: Construct validity and assessment implications". Psychological Assessment. 1 (1): 6–17. doi:10.1037/1040-3590.1.1.6. ^ Zagon, I. K.; Jackson, H.J. (1994). "Construct validity of a psychopathy measure". Personality and Individual Differences. 17 (1): 125–135. doi:10.1016/0191-8869(94)90269-0. ^ Hare, Robert D. (2003). Psychopathy checklist-revised technical manual (2 ed.). Toronto, Ontario, Canada: Multihealth Systems, Inc.
^ Hare, Robert D.; Neumann, Craig S. (2008). "Psychopathy as a Clinical and Empirical Construct". Annual Review of Clinical Psychology. 4 (1): 217–46. doi:10.1146/annurev.clinpsy.3.022806.091452. PMID 18370617. ^ Neumann, C. S. (2007). "Psychopathy". British Journal of Psychiatry. 191 (Oct): 357–358. doi:10.1192/bjp.191.4.357a. PMID 17906249. ^ a b "Into the Mind of a Psychopath | DiscoverMagazine.com". Discover Magazine. Retrieved 2018-02-28. ^ Singh Jay P (2013). "Authorship Bias in Violence Risk Assessment? A Systematic Review and Meta-Analysis". PLoS ONE. 8 (9): e72484. doi:10.1371/journal.pone.0072484. ^ "Measuring the Quiet Man: Estimating Risk of Violence | Psych Central Professional". Psych Central Professional. 2014-06-01. Retrieved 2018-09-17. ^ "We look at what happens in the brain of a psychopath". Medical News Today. Retrieved 2018-09-17. ^ Hare, Robert D. Without Conscience: The Disturbing World of Psychopaths Among Us, (New York: Pocket Books, 1993) p. 25. ^ Rutherford MJ, Cacciola JS, Alterman AI (1999). "Antisocial personality disorder and psychopathy in cocaine-dependent women". The American Journal of Psychiatry. 156 (6): 849–56. doi:10.1176/ajp.156.6.849. PMID 10360122. ^ Patrick CJ (2005). Handbook of Psychopathy. Guilford Press. ISBN 9781606238042. Retrieved 18 July 2013. ^ a b c Hare RD (1 February 1996). "Psychopathy and Antisocial Personality Disorder: A Case of Diagnostic Confusion". Psychiatric Times. UBM Medica. 13 (2). Retrieved 19 May 2017. ^ a b Hare RD, Hart SD, Harpur TJ (August 1991). "Psychopathy and the DSM-IV criteria for antisocial personality disorder" (PDF). Journal of Abnormal Psychology. 100 (3): 391–8. doi:10.1037/0021-843x.100.3.391. PMID 1918618. Retrieved 19 May 2017. ^ Belmore M. F., Quinsey V. L. (1994). "Correlates of psychopathy in a noninstitutional sample". Journal of Interpersonal Violence. 9 (3): 339–349. doi:10.1177/088626094009003004. ^ Hersh K., Gray-Little B. (1998). "Psychopathic traits and attitudes associated with self-reported sexual aggression in college men". Journal of Interpersonal Violence. 13 (4): 456–471. doi:10.1177/088626098013004003. ^ Hare, Robert D. Without Conscience: The Disturbing World of Psychopaths Among Us, (New York: Pocket Books, 1993) pp. 25–30. ^ Crighton D (2009). "Uses and abuses of the Hare Psychopathy Checklist". Evidence-Based Mental Health. 12 (2): 33–36. doi:10.1136/ebmh.12.2.33. ^ "Can A Test Really Tell Who's A Psychopath?". NPR.org. Retrieved 2018-02-28. ^ Verona E, Patrick CJ, Joiner TE (2001). "Psychopathy, antisocial personality, and suicide risk". Journal of Abnormal Psychology. 110 (3): 462–70. doi:10.1037/0021-843X.110.3.462. PMID 11502089. ^ Ochberg FM, Brantley AC, Hare RD, et al. (2003). "Lethal predators: psychopathic, sadistic, and sane". International Journal of Emergency Mental Health. 5 (3): 121–36. PMID 14608825. ^ a b c d "The Psychopath Next Door". Doc Zone. Season 2014-15. Episode 7. November 27, 2014. 3 minutes in. CBC Television. Canadian Broadcasting Corporation. Archived from the original on April 6, 2015. Retrieved April 24, 2015. ^ "Inside A Psychopath's Brain: The Sentencing Debate". NPR.org. Retrieved 2019-03-30. ^ "Psychopath". Equinox. December 7, 2000. Channel 4. Channel Four Television Corporation. Hare, R. D. (2003). "The Psychopathy Checklist – Revised, 2nd Edition." Toronto: Multi-Health Systems. Hare, R. D. (1980). "A research scale for the assessment of psychopathy in criminal populations". Personality and Individual Differences. 1 (2): 111–120. doi:10.1016/0191-8869(80)90028-8. Hill, C. D.; Neumann, C. S.; Rogers, R. (2004). "Confirmatory Factor Analysis of the Psychopathy Checklist: Screening Version (PCL:SV) in Offenders with Axis I Disorders". Psychological Assessment. 16 (1): 90–95. doi:10.1037/1040-3590.16.1.90. PMID 15023097. Vitacco, M. J.; Neumann, C. S.; Jackson, R. (2005). "Testing a four-factor model of psychopathy and its association with ethnicity, gender, intelligence, and violence". Journal of Consulting and Clinical Psychology. 73 (3): 466–76. doi:10.1037/0022-006X.73.3.466. PMID 15982144. Vitacco, M. J.; Rogers, R.; Neumann, C. S.; Harrison, K.; Vincent, G. (2005). "A comparison of factor models on the PCL-R with mentally disordered offenders: The development of a four factor model". Criminal Justice and Behavior. 32 (5): 526–545. doi:10.1177/0093854805278414. Babiak, P., & Hare, R. D. (2006). "Snakes in suits: When psychopaths go to work", New York: Harper Collins.